One of the lesser-known but super effective vet rehabilitation techniques for pets is Acupuncture Therapy. It involves the use of specially designed needles to induce cellular and tissue response on the body of a pet or even human as the case may be. Originally from the Chinese medical healers, acupuncture therapy focuses on inducing self-healing of the body by stimulating its natural survival components. The question now is, how exactly your pet can benefit from acupuncture therapy as a form of treatment. Safari Veterinary Care Centers provides a professional acupuncture therapy for pets in Texas. Our in-house experts are thoroughly experienced in delivering this procedure to pets with the best results to show for it. In this post, we have discussed in great detail how acupuncture for dogs and other household pets work. First, it is important to understand that Acupuncture works by stimulating specific points in the tissue that are connected to the neurohormonal components of the body. These specific points are connected to components like the nerves, neurovascular complexes, cellular system etc. When Acupuncture therapy is localized to the head, it can induce a positive reaction in the brain which can generate copious amounts of internal opioids, glutamate, NMDA receptors, serotonin and cholecystokinin which all act together to create a balance between the parasympathetic and sympathetic nervous system of the pet’s body. As a pet care therapy that involves the stimulation of nervous transmitters of responses in the body, vet care centers that offer dog acupuncture utilize its effect on the limbic system of the brain to relieve stress in its different forms. Dogs undergoing serious pain can be offered acupuncture as an effective means of treatment through natural means. After a while, it’s quite normal for the body’s natural immune and anti-inflammatory responses to reduce in efficacy. This happens even to pets just as it does to humans. When this is the case, there is a need for it to be re-stimulated by an external action. Acupuncture provides a natural means of activating and stimulating the body’s immune and anti-inflammatory responses to become active once again in defense of the pet’s body. With acupuncture therapy, your pet is likely to experience a revitalized immune and anti-inflammatory response. Acupuncture therapy works by reducing pain through the release of pain-causing endorphins. These endorphins include Cytokines which are released when an acupuncture activity stimulates the nerve fibers surrounding the other nerves in the spinal cord. This part of the nervous center is also known as the gate control theory of pain. The release of Cytokines and other inflammatory-causing chemicals leads to a relief of the pain building within that area. It is advisable to allow only a trained expert in Vet rehabilitation League City to carry out this period on your pet. Acupuncture therapy provides a means of naturally helping your pet’s body to generate pain relieving neuro-chemicals. Apart from Endorphin, Serotonin is also released into the pet’s body and helps in speeding up the pain relief process. At Safari Veterinary Care Center, we currently use electrical stimulation of the specific acupuncture points to relieve pain and hasten rehabilitation of the pet’s condition. Also known as Electroacupuncture, it is not as painful as the manual alternative where pins are used. Electroacupuncture delivers a better analgesic effect, cuts down faster on pain and inflammation and reduces stress on the affected pet. If your pet dog is often in pain due to some health condition and other treatment methods have failed, considering dog acupuncture therapy might just be the way out. 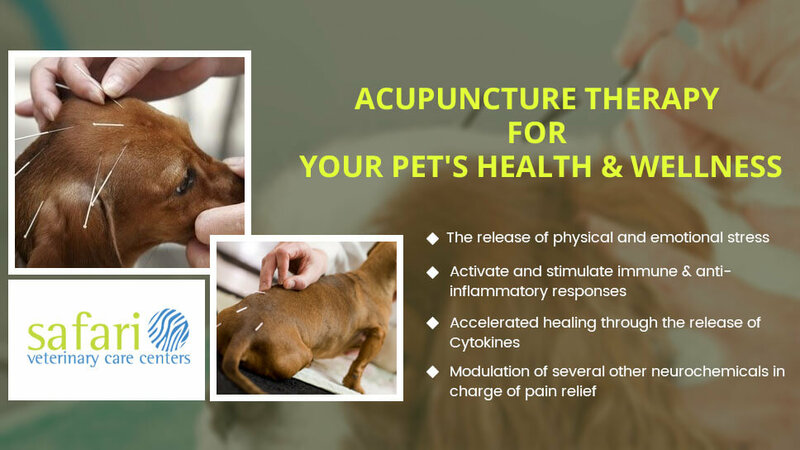 With Acupuncture therapy, you can be sure of a treatment procedure that uses your pet’s natural body response to relieve it of pain without any known negative side effects. To get started today, you can contact an emergency animal hospital, League City, Texas! We went to Safari with our Bengal cat. They are very courteous, knowledgeable, helpful, friendly, and explained everything to us so we could understand it. They clarified and verified with cost that we were ok with and understood everything before they did anything. They gave us options not just one idea of how to do something if there was an option. We are very pleased with the professional atmosphere.